Ishbel Cavaleri of Nomadic Wellness is a yoga, Pilates, and nutritional therapist specializing in rehabilitation for people with injuries and chronic health challenges. She offers in person and remote sessions for clients. 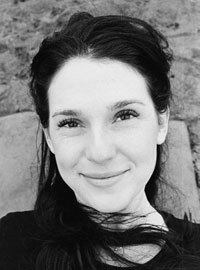 With over 15 years of experience and numerous certifications in yoga, STOTT Pilates and nutritional therapy, Ishbel is a brilliant movement therapist. Her clients call her the “body whisperer” because of her uncanny ability to customize exercise routines for pain relief and healing. Ishbel has been doing business coaching with me for two years; her business and personal transformation during that time has been astounding! When Ishbel first came to me, she was frustrated, working long hours with a full book of clients and not getting paid enough for it. Her one-on-one sessions with clients were tiring and it seemed she’d reached a ceiling with the amount she could charge per hour at the studio. Though still passionate about her work and clients, it was beginning to take a toll as she took on more clients and worked harder to earn more money. Through our work together, Ishbel was able to double her income while reducing her client load and work hours. Ishbel had opened up her own studio years before, but it had ended in a nightmare of landlord, partnership and personnel issues. When Ishbel and I began work together, she was working with over 40 clients each month doing one-on-one sessions in another studio. She’d always struggled to make money, and though she was successful, the pace was exhausting. Ishbel got certified in Nutritional Therapy, took on more clients, did teacher trainings and started doing a few remote sessions to attempts to increase her income. Unfortunately, this also increased her stress. 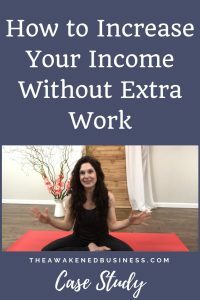 Her dream was to reduce her work hours and client load while increasing her income at the same time. She knew there had to be a way to reach more people and make more money without burning out. One of the first things we did in our Awakened Business coaching together was to clarify exactly what results Ishbel wanted, how she would know when she got them, and an agreement to grow her business in a way that supported her health and free time. We created her first online course to address the biggest issue of her clients, back pain, and launched it successfully to her current and past client base. During our coaching, Ishbel let go of limiting beliefs around money and the inability to ask for and receive what she desires. As a result, Ishbel negotiated new higher rates at the studio that allowed her to reduce her client load without sacrificing her income. Reduced her work week to 4 days with fewer clients paying higher prices. Launched and sold her first online course, the Simple Back Relief Program, as passive income. All of this was accomplished at a pace that allowed for self care and time off with loved ones. Ishbel is currently on maternity leave with her new baby Ila Rose. She’ll be back soon for our next phase of coaching to expand her online Nomadic Wellness University into a library of courses so she can make a difference in the lives of more people, enjoy family life and travel at the same time. “Before I started working with Stephanie, I was in a business rut. I had all of these overflowing ideas and ambitions, but I was stymied by a lack of direction, support and focus. “Working with Stephanie is like calling an old friend who you know will be both kind and honest, innovative and systematic as you flesh out your dreams. Since I’ve started working with Stephanie, I have accomplished more in a few months than I’ve accomplished in several years. My business now has a very clear direction, and each day I complete tasks that I am certain will get me one step closer to fulfilling my goals. “I can see the end product. I can see the path my business will travel, and this is invaluable for me! There are so many great things about working with Stephanie, but from a purely practical perspective, I know that every time I work with her I will come away from our meeting with several action items I can immediately put into play to progress my business. She makes building a business fun, effective and easeful. It doesn’t have to be as hard as you think it does, and you can even learn a little bit about yourself along the way. “During the time I’ve been working with Stephanie, I have overcome debilitating fears, gone after my dreams and seen my income double. Things that used to feel impossible are now a breeze. I am confident that with Stephanie’s guidance I will continue to see my business flourish in ways I never could have imagined! Interested in growing your income and impact without burning out? Contact me for a free no-pressure conversation to see how I can help.